The Yeppen Floodplain Upgrade Project (YFUP) comprises the construction of high-level flood access between the Burnett Highway and Yeppen Roundabout, south of Rockhampton. The upgrade entails the construction of two bridges around 2.1km in total length. 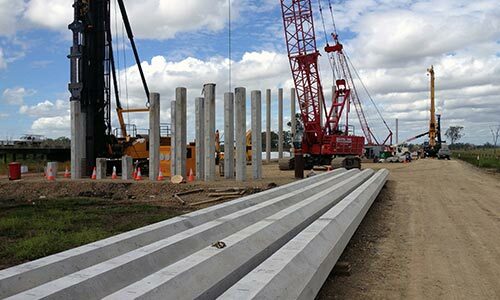 Bridge piers are supported by groups of 16 octagonal prestressed concrete piles with a total of approximately 1000 piles on the project. The site is located on an alluvial floodplain with a sloping rock profile varying from roughly 15m to 45m depth. Soft to firm clays are often encountered at the surface overlying medium dense to dense sand. Combined with limited investigation data, varying subsurface profiles made pile acceptance and signoff confidence essential to the critical path piling activities. FSG has had a long running involvement in YFUP. From peer review and optioneering for the Department of Transport and Main Roads (TMR), to tender design, and finally full time onsite engineering support, pile testing and verification during the construction with John Holland. 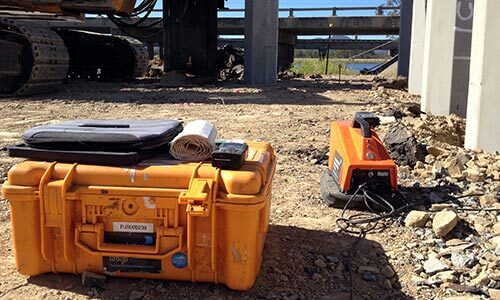 The specification called for two PDA full drive tests at each pier and abutment, roughly 126 PDA tests in total, to assess driving stresses and geotechnical capacity. In a first for Queensland, 100% of piles were monitored at end of drive using the Pile Driving Monitor (PDM) to record final set and temporary compression. The use of the PDM was a major safety innovation for the project as it removed the need for piling personnel to work under working hammers. Through correlation with PDA testing and CAPWAP analysis on each pier, the PDM was able to estimate impact energy and pile capacity for every pile on the project immediately after driving, providing increased confidence to the designers and asset owner. PDM was implemented on site with no disruption to field operations and in fact aided the overall productivity by allowing a large number of piles to be accepted at higher founding levels. All construction data and test results were entered into FSG’s Pile Manager© online database allowing the piling contractor, constructor and owner to view progress in real time. The use of the PDM and PDA allowed all piles to be installed to the asset owner’s satisfaction in variable ground conditions with limited geotechnical data. of piles and allowed personnel to remotely monitor end of drive set and temporary compression, completely eliminating a significant safety hazard.